Tokyo, December 5, 2013 - Fuji Heavy Industries Ltd. (FHI), the maker of Subaru automobiles, today announced that the company will participate in "Eco-Products 2013", one of the largest environmental exhibitions in Japan to be held at Tokyo Big Sight from December 12 through 14. Under its exhibition theme "Eco-cars can be more fun, more eco-friendly with Subaru", the Subaru booth will showcase Subaru's environmental efforts and technologies through live presentations, along with displays of the "SUBARU XV HYBRID", its first hybrid model released in June and the "LEVORG" sports tourer prototype premiered at the Tokyo Motor Show 2013. 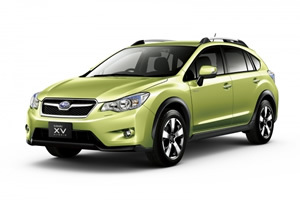 At the "Eco-car test ride experience" section, visitors can test-ride the SUBARU XV HYBRID model on the backseat. Subaru's first-ever hybrid vehicle offers the brand's distinctive, enjoyable driving experience. By using a motor assist function for the engine output, both enhanced fuel economy and smooth acceleration have been achieved. The Subaru's unique Symmetrical AWD (All-Wheel drive) layout delivers superb driveability based on its low center of gravity and superior weight balance. The new sports tourer Levorg is the fruit of Subaru's commitment which not only offers driving enjoyment but also practical touring abilities which ensure a stress-free drive even in long distances. The newly developed 1.6-liter Horizontally-Opposed direct injection turbo "DIT" engine achieves both brisk driving pleasure and superb fuel performance. In addition, the next-generation "EyeSight" offers many safety features such as a steering assist control function. 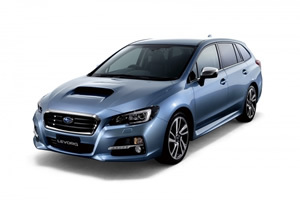 Featured with its latest technologies, the Levorg is a model that represents the new generation of Subaru. Exterior color may be different on the display model.